This program prints Code 128B, EAN128B, Code 39 , Code 93, Code 25 interleaved ,EAN13,EAN8 or UPC_A and text labels. User can set the page, label and page margins print the several barcode and text labels in a few steps. You do not need to buy a barcode printer to print barcode now. MemBarcode can help you to print barcode in common printer, just like you print a document. You just need to setup some barcode and text settings and print barcode and text several pages. The Code 25 type only allows you to print numeric. Finally, you can set the Left and Top value. There two values specify where the barcode will be printed in a cell. In the Text Setting, you can set maximum three text labels and the position, you can change the font of the text by pressing the [A] button. In Page Setup, you can select Page Size and the number of page. You can select "Custom" Page size and input any value of Height and Width. You can also set the margin of page. In Cell Setting, you can set the Height and Width of each cell, number of column and row and each distance. You can use Setup Wizard to find the best values. You can check or uncheckedPrint Barcode or Print Text to print or not print barcode and text. After that, you can press [Preview] button to preview the change and [Print] to print. Take the image above as an example. The Initial String is "MEMDB-", the Initial Value is 1 and the Length is 4. The topmost and leftmost barcode image is MEMDB-0001. Since the Increment value is 1, the next image will be MEMDB-0002. If you set the Length to 6 and press [Preview] button, the image will become MEMDB-000001. If you needs all images the same in a page, you can set the Increment value to 0. If you do not need the digital value, you can set the Length to 0. Trial version can allow you to print barcode 10 times and print "Trial Version" in every barcode images. Remark: If you want to print EAN13 with short and long line, you can try MemDB EAN13 Barcode Maker. If you only want to make a different type of barcode image, you can try MemDB Barcode Maker (Price US $15) . 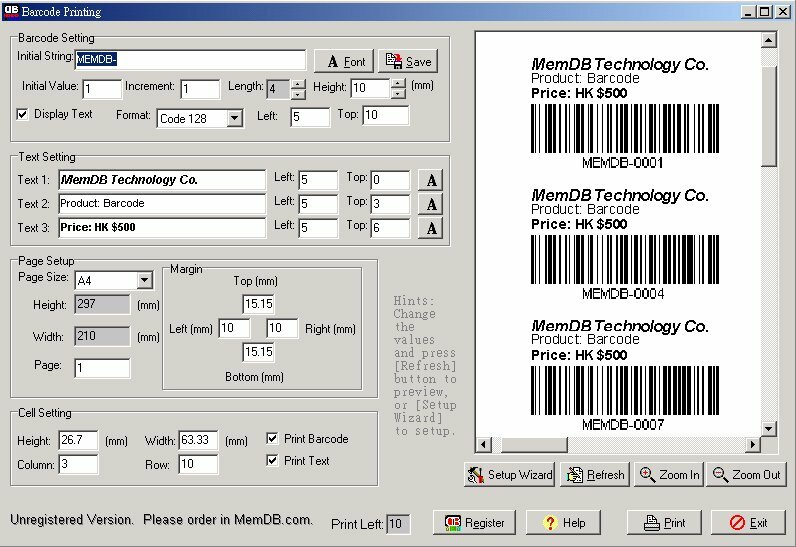 If you need a database to manage and print the barcode, you can try MemDB Memory Database System. Please input your registration name (you can leave it blank if you want to use your email) and then press "Buy Now" button. After you have paid the charge, you will receive the password immediately through email. If you have any enquery, please contact us. If your country does not support Paypal, you can contact us. Install: Use WinZIP to unzip the MemBarcode.zip, then run setup.exe to install.